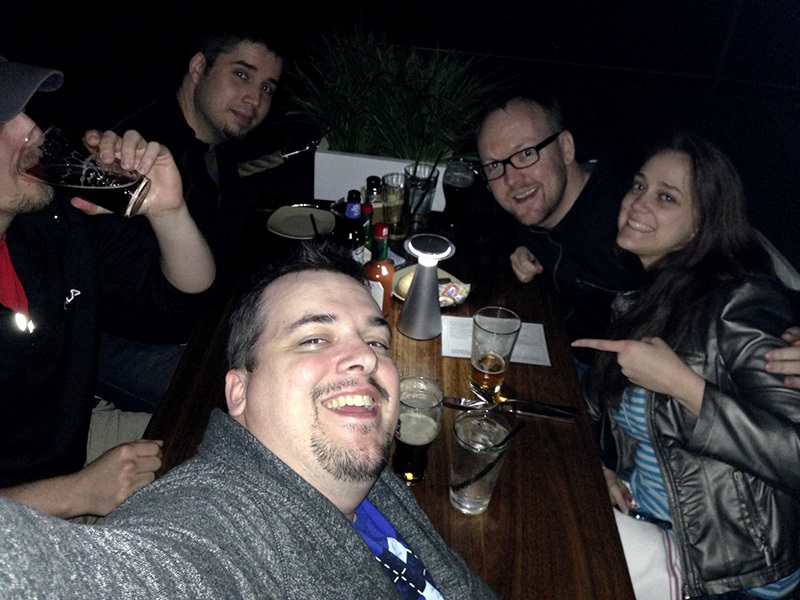 There’s just something special about Boston, and PAX East just makes it that much more special. 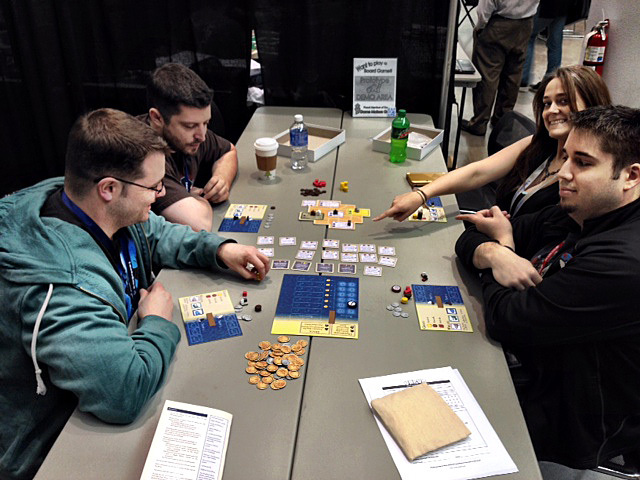 The grand spectacle that is GenCon really pales in comparison to the crazy amount of technology and money that is pumped into the Penny Arcade Expo. However, next to all that technological excess lies the tabletop hall and a small booth dedicated to handmade prototypes – quite the contrast. We call that booth home, and in this podcast we share our adventures there and abroad in Beantown. 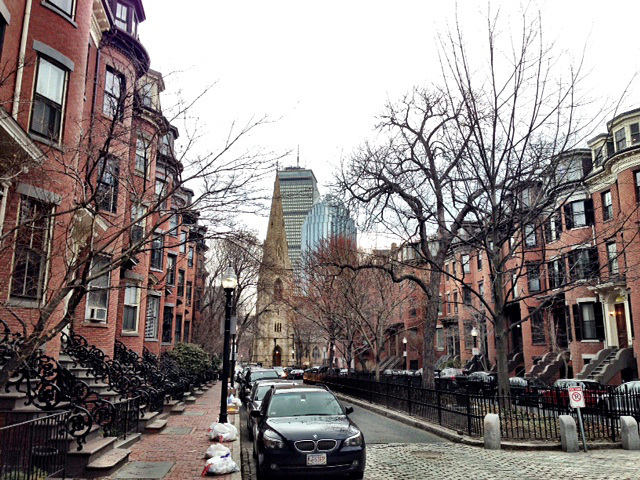 Beautiful South End of Boston, my old neighborhood and home to the B&B where we all stayed. And, yes, it’s trash day. The mosh pit that is part of the main exhibit hall. 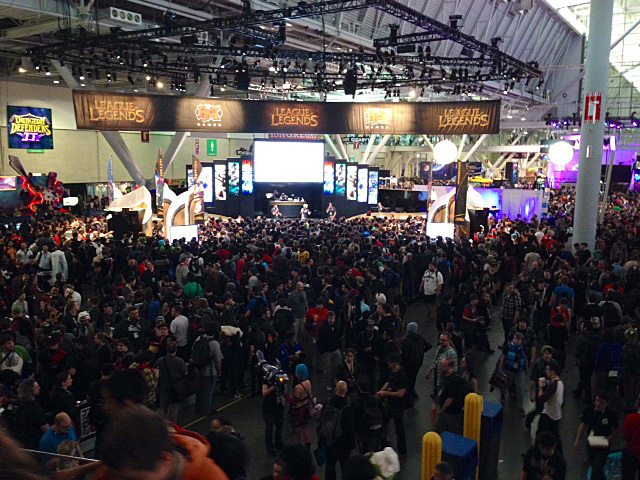 It’s wall to wall people in there, and the League of Legends booth was one of the biggest and most popular. 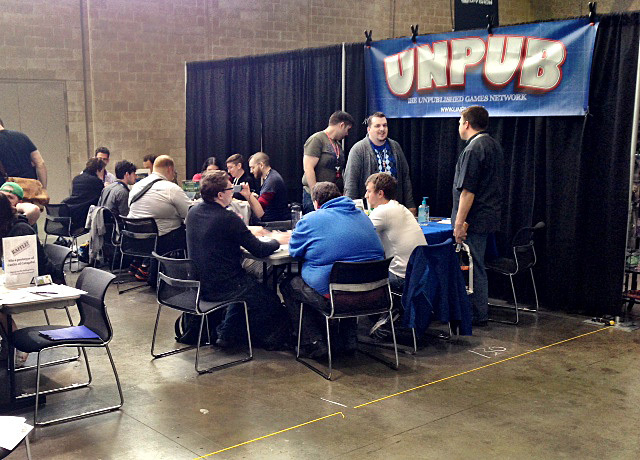 The Unpub booth! This was our con HQ. Finally digging into some unpublished play! 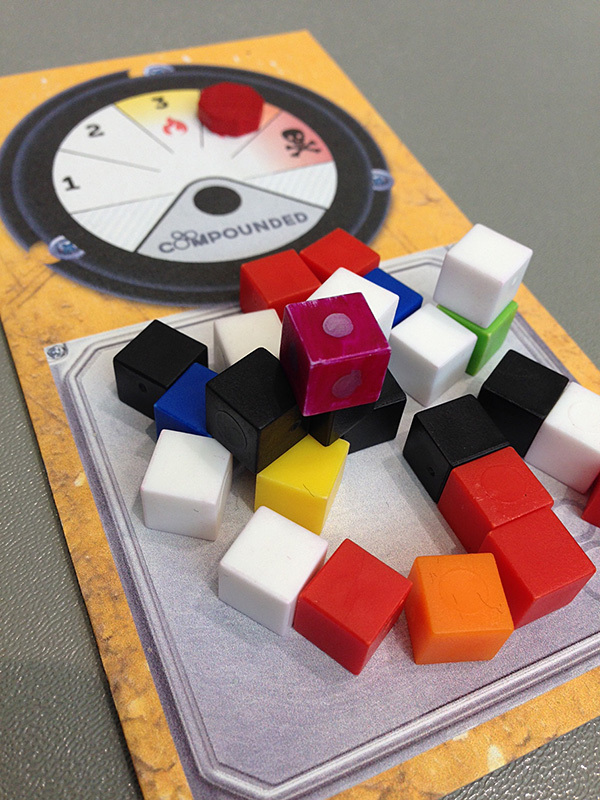 We got a five-player veteran playtest of the Geiger expansion for Compounded. It was insane. That’s a lot of radioactive elements. 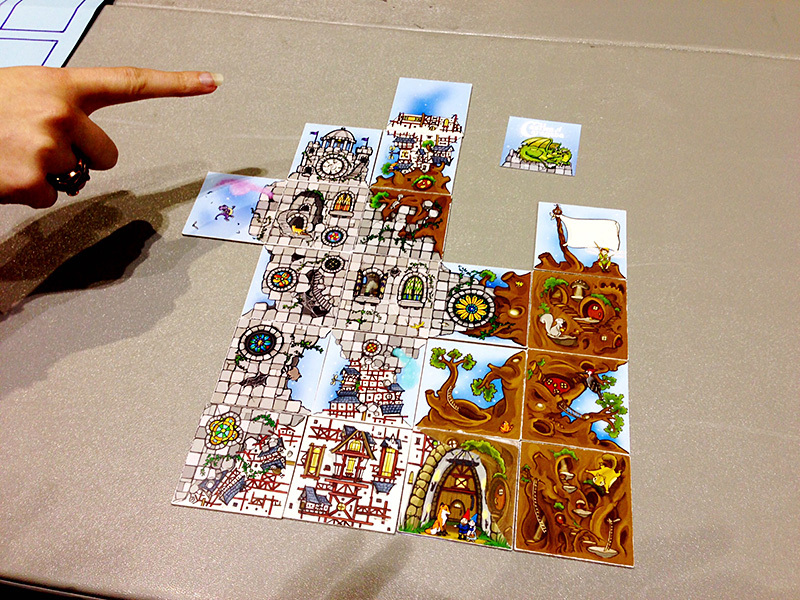 Castles of Caragaba from Dave Wilkinson! This was pretty indicative of all our nights in Boston, especially Mike constantly drinking something. Day 2 started off with Derrick Vidal’s World Shapers! 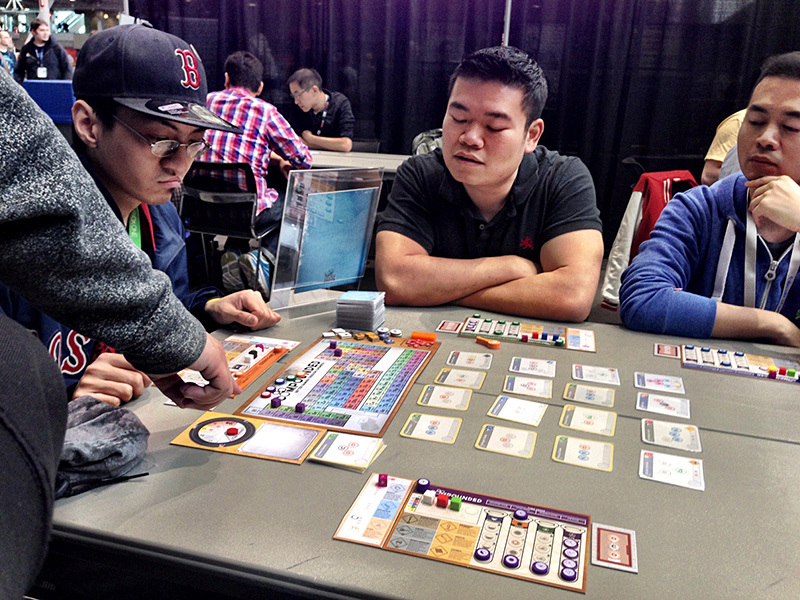 More Compounded action; people were constantly approaching the booth wanting to play. 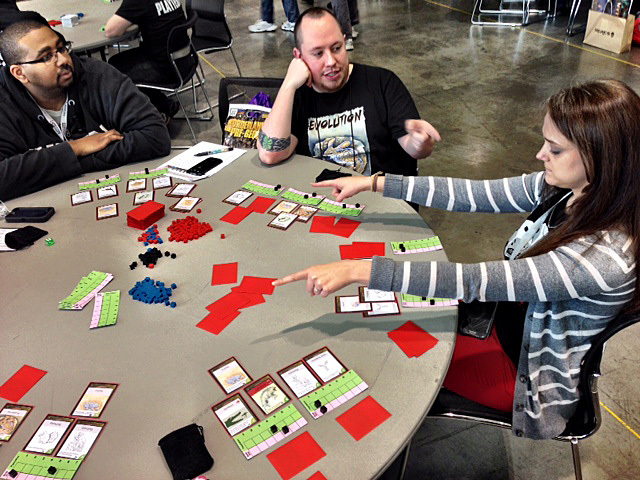 We got in a lot of great playtests of the expansion, so we’re feeling confident that it will be ready for Kickstarter in late June. 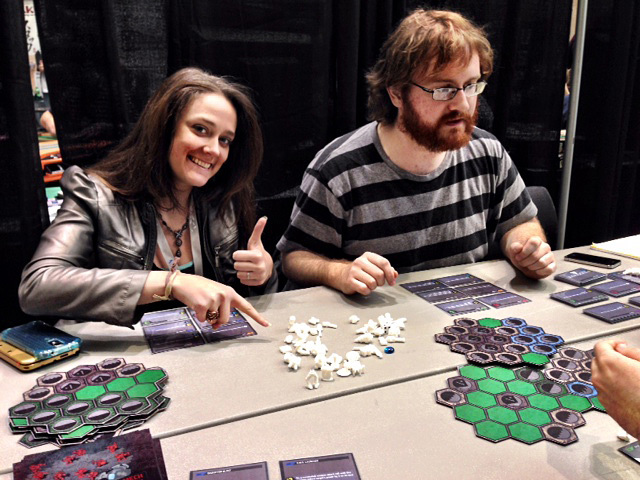 Here, Stephanie points out how much better Evolution is since North Star Games got their hands on it. 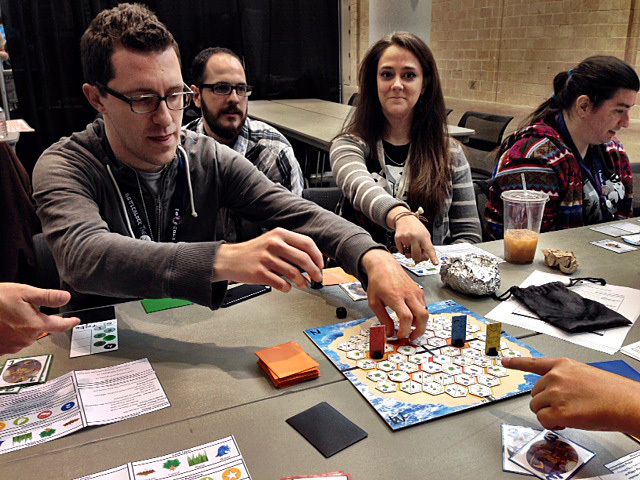 Ryan Metzler would soon kidnap Stephanie for much of the rest of the day to demo Evolution. 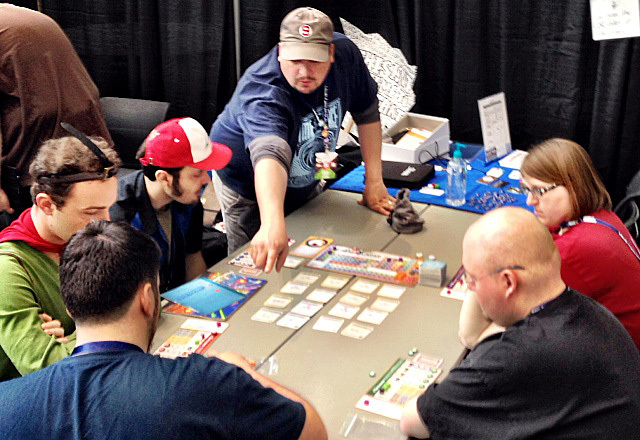 Mike Mullins demonstrates Bottom of the Ninth, a baseball microgame that he and Darrell Louder developed and prototyped the morning of Day 2! 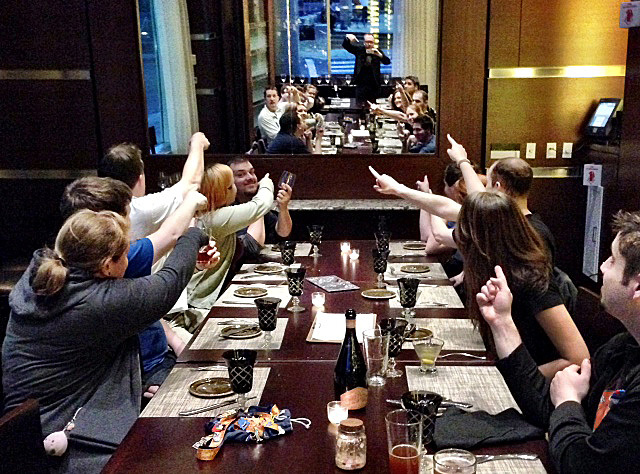 The ultimate #epicgamepoint selfie at the amazing MC Spiedo restaurant. Whaling! 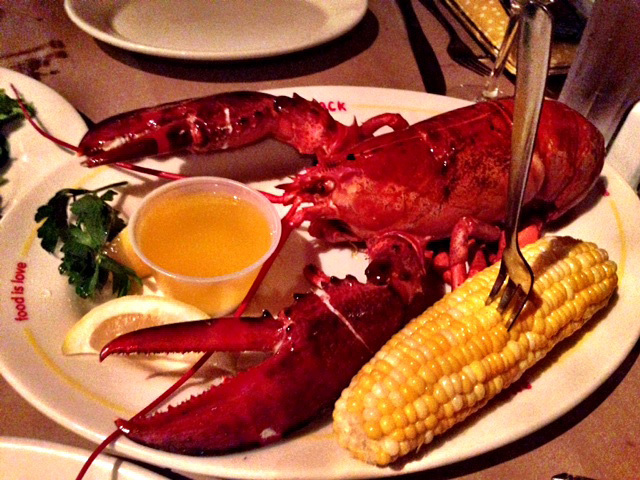 New Bedford hit the table twice on Day 3, and everyone had a whale of a time. 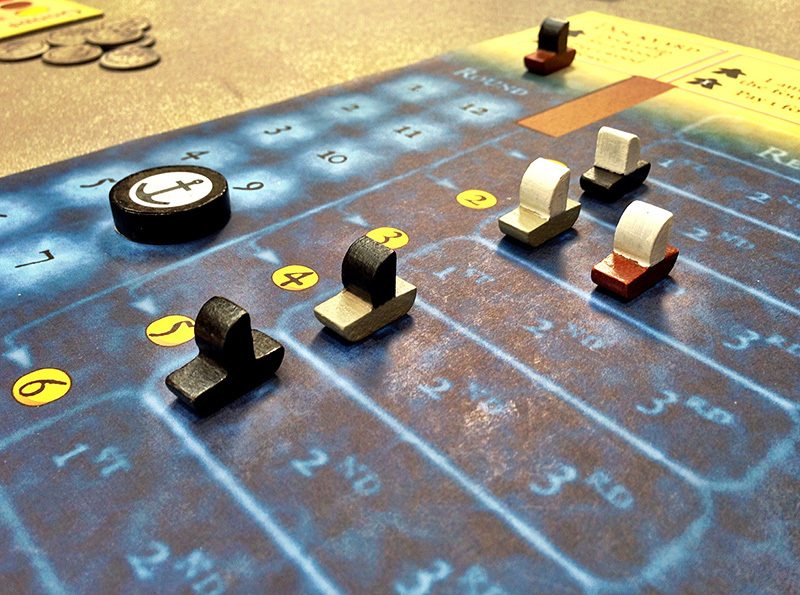 Look at that magnificent whaling fleet! If there’s one thing PAX has in spades, it’s technology. 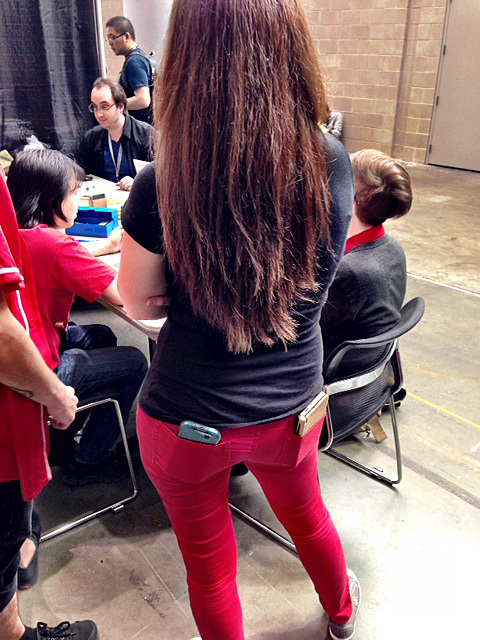 Here, Stephanie’s posterior has more tech than most booths at the con. Kobolds Are Coming!!! And they are crotchety. Getting ready for GIANT ROBOT BIG BATTLE with Mech Deck! 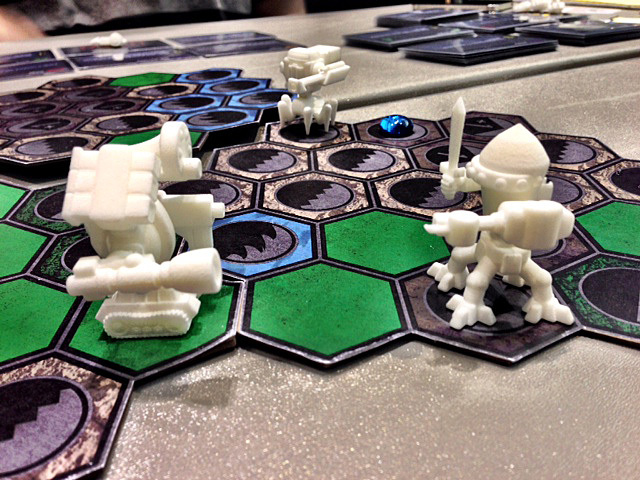 Mech Deck features customizable robots with 50 unique parts. It’s really pretty awesome. I completely understand if I should be banned from podcasting forever. 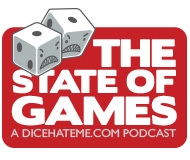 However, I had a blast at PAX East with everyone and just as much fun talking about it on this episode of State of Games. 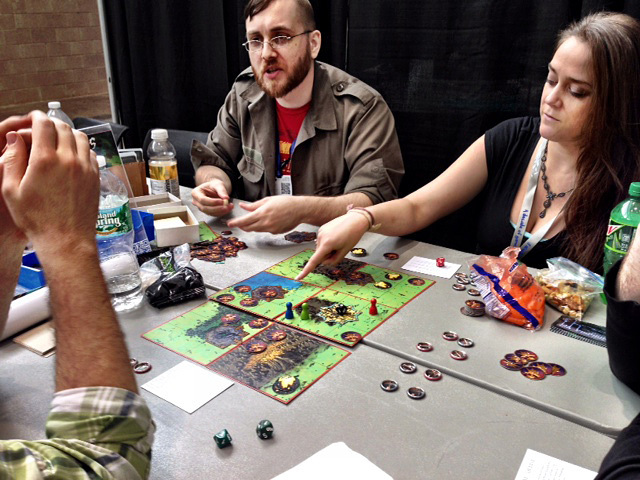 Fun podcast, was looking out for this one ’cause I’ve never attended PAX and was curious what goes on there (board game related). 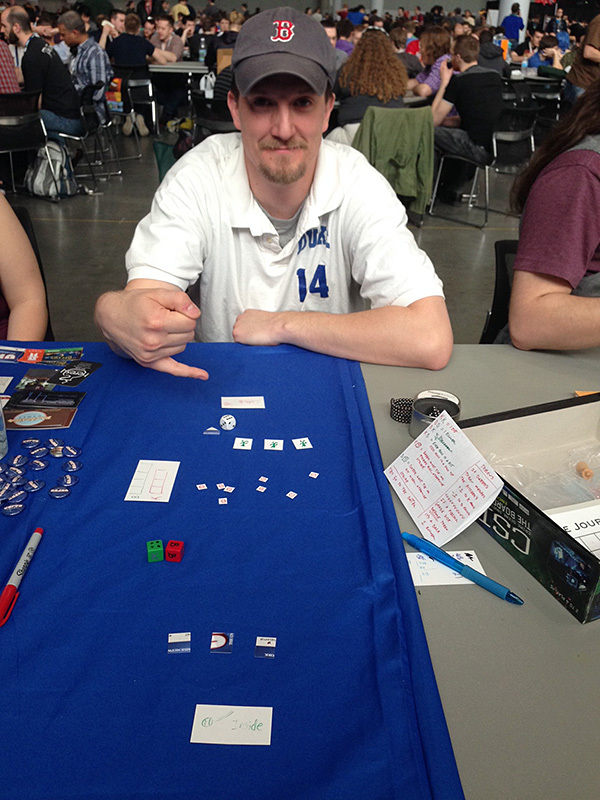 I’m glad you posted some photos as well, kinda helped with identifying the different (new) games you mentioned.